On November 20, 2015, the Federation Council and the State Duma met for a joint meeting to deal with problems of terrorism, at the Column Hall in Moscow. The session was attended by the Federation Council deputies and the State Duma members, leaders of the legislative bodies of the constituent regions, representatives of the traditional religions in Russia and public figures. The meeting was opened by the Federation Council Chair Ms. V. Matvienko, who stressed that it was the first meeting intended to consolidate the effort of not only the parliament members but also the whole civil society in the struggle against terrorism. International terrorism is the greatest danger for Russia and the whole international community, she said. ‘We have encountered an antihuman ideology, with a powerful financial and military potential, with extremely aggressive aspirations’, she reminded the assembly. the State Duma Speaker S. Naryshkin said. He believes that the tragedy of the Russian airliner, the terror acts in France and in a number of other countries will make many in the world to look differently at the developments. Then the floor was given to federal and regional officials, public figures and religious leaders. 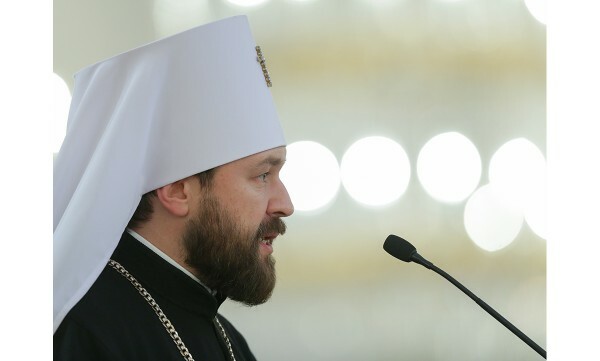 Speaking at the session, Metropolitan Hilarion of Volokolamsk, head of the Moscow Patriarchate’s department for external church relations (DECR), expressed, on behalf of this Holiness Patriarch Kirill of Moscow and All Russia and the whole Russian Orthodox Church, deep, heartfelt and sincere condolences to all those who lost their loved ones in the plane crash over the Sinai. ‘We must clearly realize that it is not a war of one religious confession against another. The very notion of ‘religious terrorism’ can only lead us astray. There is no religious terrorism whatsoever. Those who have unleashed this war do not deserve to be called the faithful. They are Satanists because they do the will of the Devil, bringing to people grief, death and destruction’. The joint session agreed on the need to create a broad anti-terrorist coalition, to toughen criminal responsibility for terrorism and complicity in it, including recruitment, agitation and propaganda of terror and the need to prevent extremism and improve the migration policy.